Over the past couple months I've been trying to stick to a more concrete skincare routine, but that doesn't mean I've stopped testing things. 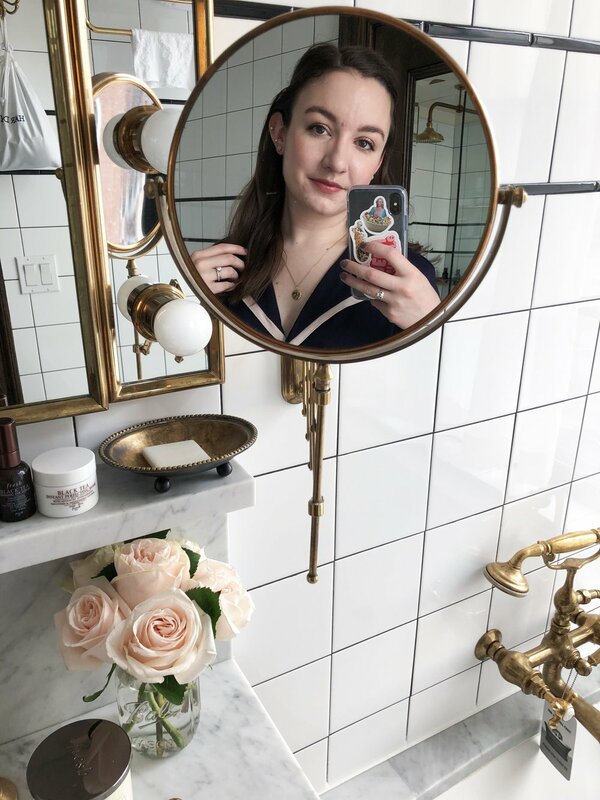 I've been testing some new products here and there and figuring out how they fit into my routine, and instead of hoarding all this information any longer I figured it was time to start sharing my thoughts so far. Too Cool For School | Let's get this one out of the way first, because I was actually sent the Too Cool For School Egg Mellow Cream* months and months ago, and I totally forgot about it until recently. I became obsessed with the Body Butter* (and still am, it's seriously the best body butter I've ever tried), but somehow the moisturizer got lost in my collection. It's a lightweight cream with a similar scent to the body butter, which I can't even describe other than faintly sweet and pleasant. It promises to hydrate and firm the skin, and boy does it do just that. It makes my skin feel so plump and firm and bouncy - it's a new favorite to wear underneath makeup. Pixi Double Cleanse | I was (very, very kindly) sent the whole Pixi Pretties Collection, and the Pixi + Caroline Hirons Double Cleanse* was the product from the collection I was most excited about. I forced myself to finish up the cleansing balm I was using before starting this, and it was so worth the wait. The pot is split into two sections - a solid cleansing balm to remove makeup and SPF, and a cleansing cream to use as a second cleanse. I always double cleanse when I wear makeup, so it's super convenient to have both cleansers housed in one tub. The solid cleansing oil demolishes all of my makeup, even waterproof mascara, with minimal effort, and the cleansing cream feels so soothing and nourishing on my skin. My skin always feels super clean but never tight afterward. Mun Skincare | I've been seeing Mun Skincare a lot on Instagram lately, and I was super intrigued and wanted to try some for myself. I ended up winning their Anarose Hydrating Rose Toner and Aknari Brightening Youth Serum in a giveaway, and I was so excited to receive them that I started testing them right away. I absolutely love the packaging first of all - super chic, heavy glass bottles that look so nice on my bathroom counter. The toner is my new favorite for my morning skincare routine - it's super soothing, refreshing, and hydrating, and it really helps to wake me up. I've only used the serum a handful of times, but I like that it's full of nourishing oils. It feels so beneficial to the skin, and it keeps it plump and hydrated throughout the day. The Body Shop | I already talked about how much I've been loving The Body Shop Oils of Life Eye Cream* in my Bright Eyes post from last week, but I was also sent the new Drops of Youth Liquid Peel* to try. I've used a product like this before, but it's still such a cool concept to me. It's a clear gel you massage into your skin, and as you're massaging it begins to ball up, taking dead skin and impurities with it. Once it's rinsed off you're left with a super smooth and glowy complexion. Something like this is the perfect thing to try if you've been wanting to try an exfoliator but are afraid of manual scrubs or chemical exfoliants. BeautyRx by Dr. Schultz | BeautyRx by Dr. Schultz is a skincare brand established in 2011 by Manhattan dermatologist Dr. Neal Schultz built on feedback from over 100,000 patients. The products focus on achieving glowing skin from home, which I am all about. I was sent three products from the line - the Gentle Cream Cleanser,* the Triple Vitamin C Serum,* and the Ultra Hydrating Eye Repair Cream. * The cleanser is now one of my favorites for the morning. It contains chamomile to soothe as it cleans, and it really helps bring down the redness in my face in the mornings. I've only tried the serum a couple times so far, but I've already been noticing a difference in the brightness of my skin. It uses three potent types of Vitamin C, and I love that it's in an opaque pump bottle to preserve its efficacy. The eye cream might just be my favorite so far though - I was suffering from extremely dry undereyes before I tried it, and it immediately sorted everything out. It's a typical cream texture, not too heavy, but still heavy enough to be hydrating, and it still works well underneath my concealer. New Face Masks on Trial | I came home to a lovely surprise package from Perricone MD a couple weeks ago containing their new Cocoa Moisture Mask* and a mini of their Chloro Plasma Purifying Mask. * So far I've only gotten the chance to try the cocoa mask, but oh man is it something special. It smells amazing, first of all, and it feels so luxurious and nourishing on the skin. It leaves my skin feeling super hydrated and ready for the next steps of my skincare. Another hydrating mask I've been super into has been the CosRX Ultra Nourishing Rice Overnight Spa Mask. I got this after seeing Mili talk about it on Sharmtoaster - she made it seem like a must-have. So far I'm absolutely loving it. It keeps my skin super hydrated throughout the night without feeling sticky or heavy whatsoever. I've also been taking her recommendation on using it over the Dr. Jart+ Ceramidin Cream, and it certainly is a winning combination. Thanks for sticking around if you're still here, I could blab about skincare all day long! Let me know if you'd like to see more in-depth reviews on anything as I test them out more in the coming weeks. What new skincare have you been trying lately?